Eat That Frog by Brian Tracy is easily one of the most famous books on productivity and overcoming procrastination out there. It’s a super short read outlining 21 great ways to stop procrastinating and get more done in less time. If you’re not familiar with Brian Tracy, you’re in for a treat. He’s one of the world’s best-known personal development teachers. He has written over 70 books and, according to his website, has consulted for more than 1,000 companies and addressed more than 5,000,000 people in 5,000 talks and seminars throughout the US, Canada and 70 other countries worldwide. 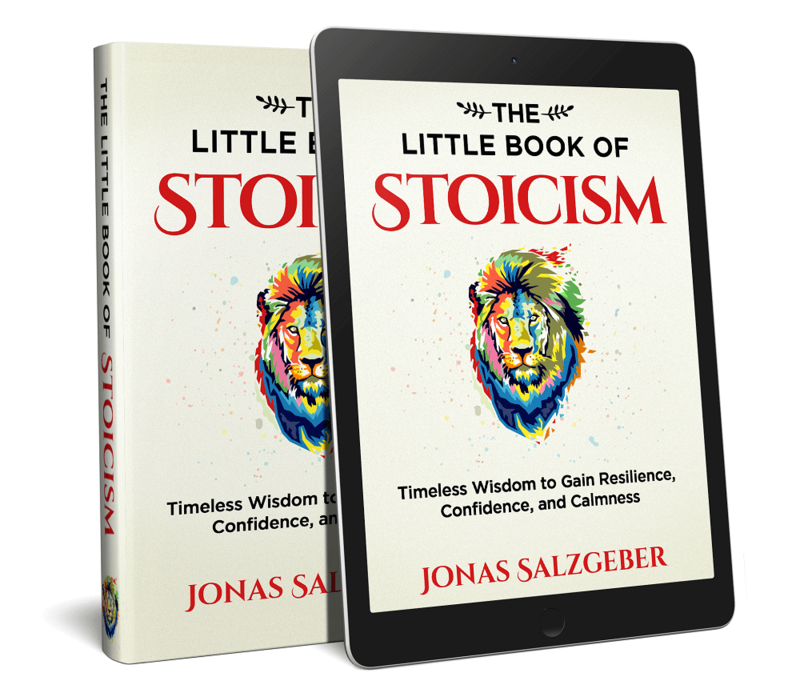 This is a great little old-school productivity book that is easy to read and provides some highly actionable strategies and a nice kick in the pants for anyone who needs it. Who Is Eat That Frog For? 1. Eat That Frog! ― What Does It Mean? “Mark Twain once said that if the first thing you do each morning is to eat a live frog, you can go through the day with the satisfaction of knowing that that is probably the worst thing that is going to happen to you all day long. Your ‘frog’ is your biggest, most important task, the one you are most likely to procrastinate on if you don't do something about it. It is also the one task that can have the greatest positive impact on your life and results at the moment. This is another way of saying that, if you have two important tasks before you, start with the biggest, hardest and most important task first. Discipline yourself to begin immediately and then to persist until the task is complete before you go on to something else. Think of this as a ‘test.’ Treat it like a personal challenge. Resist the temptation to start with the easier task. Continually remind yourself that one of the most important decisions you make each day is your choice of what you will do immediately and what you will do later, if you do it at all. So that’s where the name of the book comes from. “Eat that frog!” means to start your day with the biggest, most important, and most dreaded task. It’s also the task you are most likely to procrastinate on. 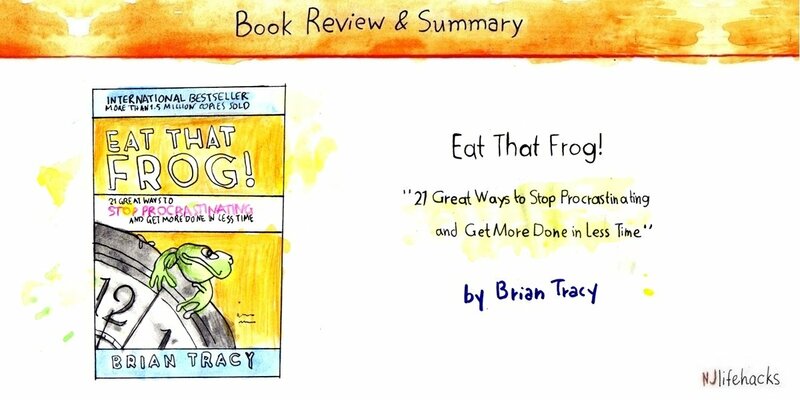 Brian Tracy is also about disciplining yourself to eat that frog first thing in the morning every single day. If you do, you will reach new heights of productivity while learning to overcome procrastination and while building self-discipline. Brain Tracy comes back to this 4-part combination over and over again in this book. Work on It Single Handedly. Seriously, he sounds like a broken record: First, select your most important task. Then, begin it immediately and work on it single-mindedly until it’s complete. Tracy references the 80/20 rule, also called the Pareto principle or the law of the vital few. It states that, for many events, roughly 80% of the effects come from 20% of the causes. What does that mean for your life? It means that 80% of your results come from 20% of your actions. Put differently, it means that 20% of what you do leads to 80% of the results. On the flipside, it also means that 80% of what you do leads to only 20% of the results. In other words, you are wasting 80% of your time on low-value activities. The solution? Prioritize. Prioritize. Prioritize. Stop pursuing low value activities and focus on high value activities instead. In other words, select the most important task!! Stop being busy being busy… focus on what matters instead. Once you know what your most important task is, get started on it immediately. Tracy is really big on this, stating that it’s very important to develop the habit of tackling uncomfortable tasks immediately. Don’t think about it. Don’t worry about it. Don’t let your mind come up with excuses. Get in the habit of beginning immediately. You can use Mel Robbins’ 5-second rule to get started: Give yourself a countdown and then off to the races! 5-4-3-2-1-GO! Remember from the research on procrastination that once you’ve started a task, it’s actually not nearly as bad as you thought. It’s actually kind of fun. Making progress feels good. And before you know it, you’re enjoying an upward spiral of self-generating satisfaction, progress, self-efficacy, and so on. Get in the habit of getting started immediately. It could very well be the most important habit you ever develop in your fight against procrastination and your pursuit of higher productivity. Whether those numbers are correct is probably up for debate. However, what Brian Tracy is essentially talking about here is limiting the productivity-slashing effects of multitasking and of something called attention residue. 6. Finish What You Start!! Successful, effective people are those who launch directly into their major tasks and then discipline themselves to work steadily and single mindedly until those tasks are complete. I used to fall into this trap all the time. I’d get started on a task and then abandon it the moment it got uncomfortable or I got stuck. This created several problems. First, it made it incredibly hard to get back to the task. Why? Because it was a half-finished task. And because the part where I needed to get started again was exactly the part I was stuck on. This created massive resistance to get going again. Second, abandoning tasks before they’re finished leaves too many tasks open. Your brain can’t concentrate well when it has to keep in mind five different tasks that you’ve started on but not finished yet. This is known as the Zeigarnik effect and can put a real strain on your brain’s resources. Look, finishing tasks is hard. For whatever reason, it’s usually the last 5% of the task that create the biggest resistance. The temptation is big to just postpone it and finish it at a later time. For your own productivity’s sake, forego this temptation and finish the task. I talk about this in some of my articles on procrastination. A major reason for procrastination is feeling overwhelmed. If your mind sees too many tasks at once, it feels like there’s just too much to do. This creates resistance and a kind of blockade in the mind. If I focus on writing a 10-part summary, that makes me feel uncomfortable. Every part of my body starts revolting and my mind starts telling me to do something easier instead. That’s why I only ever focus on one point at a time. I can choose one idea from the book, find a good quote, and add my commentary to it. That’s fairly easy. If I focus on writing a complete 3,000-word summary, that creates a blockade and I can’t do it. So yeah, when you’re getting stuck, try to forget about everything that’s still to be done. Instead, focus on the very next step. Theodore Roosevelt puts it nicely: "I dream of men who take the next step instead of worrying about the next thousand steps." Two of the most important ingredients in the productivity puzzle are focus and willpower. Guess what both of these require massive amounts of? While time management is important for productivity, energy management may be even more important. You can’t really get more time, but you can get more energy. And the more energy you have, the more productive you’ll be. What am I doing that I should do less of? “First, read in your field for at least one hour every day. Get up a little earlier in the morning and read for 30-60 minutes in a book or magazine that contains information that can help you to be more effective and productive at what you do. Second, take every course and seminar available on key skills that can help you. Attend the conventions and business meetings of your profession or occupation. Go to the sessions and workshops. Sit up front and take notes. Purchase the audio recordings of the programs. Dedicate yourself to becoming one of the most knowledgeable and competent people in your field. Brian Tracy, like most highly successful people, is a big advocate of lifelong learning. If you’re not in the habit of continually getting a little bit better every single day, I highly suggest you get on that. Start reading books. Listen to audio tapes. Watch YouTube videos. Read articles. And so on. I’ve read a lot of books by Tracy and this is a concept he comes back to in every single one of them. He usually refers to it as the law of cause and effect. It states: For every action, there is a reaction. For every cause, there is an effect. Neither success nor failure happen by accident. Any success is the result of doing certain, specific things over and over again. Any failure is the result of doing certain different, specific things over and over again. The law of cause and effect states that if you copy what successful people do, you will get the results that successful people get. It’s no miracle. It’s no accident. It’s simply a matter of cause and effect. Therefore, if you want to become more successful, simply copy what the most successful people in the world do. Commit to lifelong learning, eat that frog every morning, guard and nurture your energy levels, and so on. If you enjoyed this summary, you might enjoy the following books. Maximum Achievement by Brian Tracy. This is one of Tracy’s most famous and bestselling book. Deep Work by Cal Newport. If you want more productivity advice, I highly suggest giving this one a read. Solving the Procrastination Puzzle by Timothy Pychyl. This is another small but useful book all about overcoming procrastination. P.S. Do You Want My Best Procrastination Tricks for Free? I've been battling procrastination all my life, and I've made massive progress over the last few years. Thx, man! What did you play? Nils, a great summary, thanks for sharing this incredibly valuable piece. Great article, very well written, thank you so much! Hah, it’s a bishhh, indeed! The book is great… but you gotta do the work ! I like the idea about single handed because it stopping me from delaying the most important project.